Share your love for everything coral and your awesome beauty finds! Living Coral is so pretty! I can't wait to see how its incorporated within beauty. Butter London polishes are so stunning! @cianni I almost bought it when it was on sale but talked myself out of it. Nope, not my kinda hue. Totally clashes with my 'do! @greeneyedgirl107 What a beautiful piece. So timeless. Thanks for sharing. Oh that's a nice vintage piece @greeneyedgirl107! This is such a pretty color! I miss the Pantone x Sephora Collection collabs. This would have been a good one! Even just a lipstick. @Mcakes @veronika23 Yes! Those collabs were (mostly) great! I would love the coral as a shadow set, blush, and polish. And as brushes too. DEFINITELY not a nail ring... because nobody needed that. I miss those collabs too @Mcakes! The first few ones were good! Although I still remember that nail ring that just wouldn't leave the site. 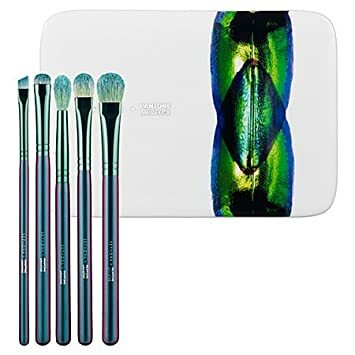 I wish I had purchased these brushes... still regret it. Oh yay! I am so excited for all the coral pretties, makeup and otherwise. Love this color! @veronika23 LOVE this shade, especially on the nails. @RebeccaBTyes! Makes a nice pedi in the summer time. I especially love neon coral lipsticks! Ooh what a pretty color! I love this color! I love the warmth, beauty & elegance of it. I AM SO HERE FOR THIS COLOR!! @veronika23 I love this color!!! !